Obviously Phil Knight was reading my blog and was inspired by my Vote Yellow campaign. Phil and Penny Knight have made a historic and HUGE donation to Oregon Health and Science University (OHSU) – $100 milion HUGE. So thanks Uncle Phil – I’m glad we share the same passions; the University of Oregon Ducks and fighting cancer – you’re a good guy in my book. 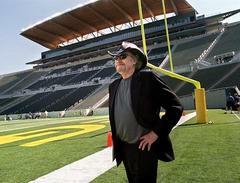 Here’s the news link: Nike founder to donate $100 million to OHSU cancer institute. Yay Phil! I love it!